how to factor a polynomial by factoring out the greatest common factor. how to factor a polynomial by grouping. how to factor difference of perfect squares. The following diagram shows some examples of Factoring Techniques. Scroll down the page for more examples and solutions of factoring techniques. When working with polynomials and complex fractions, it's important to understand and be able to find greatest common factors. 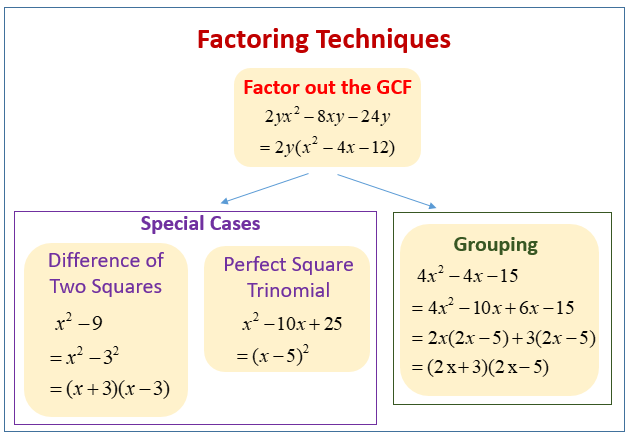 Being able to find greatest common factors will help when factoring trinomials by grouping. When factoring, we can either find the greatest common factors of two integers or find the greatest common factors of two complex expressions. Factoring out the greatest common factor. An important special case when trying to factor polynomials is a identifying the difference of perfect squares. We learn to recognize a difference of perfect squares because they have a special, easily factored form. It's also important to recognize the factored form to make the multiplication of the binomials easier. Easily recognizing the difference of perfect squares is useful when factoring quadratics that are not a difference of perfect squares. When given a trinomial, or a quadratic, it can be useful for purposes of canceling and simplifying to factor it. Factoring trinomials is easiest when the leading coefficient (the coefficient on the squared term) is one. A more complex situation is factoring trinomials when the leading coefficient is not one. To factor trinomials we use methods that involve finding the factors of their coefficients. One of the final steps in learning to factor trinomials is factoring trinomials with "a" not equal to one. In this case, "a" is the leading coefficient, or the coefficient of the squared term. When factoring trinomials with "a" not equal to one, in addition to using the methods used when "a" is one we must take the factors of "a" into account when finding the terms of the factored binomials. How to factor a trinomial when the leading coefficient is not equal to 1 by using the trial and error method?